Are European Microstates Part of the Schengen Zone? The Schengen Area is a territory of 26 European countries. It consists of 22 European Union member states and four other countries that are part of the European Free Trade Association, which are Norway, Iceland, Switzerland and Lichtenstein. You can visit any of the Schengen countries for a duration of up to 90 days in total within a period of six months with a Schengen visa or visa free if you’re a citizen of one of the countries that has visa liberalization agreement with the EU. Currently, four European Union member states, Croatia, Bulgaria, Romania and Cyprus are not yet part of the Schengen Area (without counting Ireland and the United Kingdom which opted not to join). Though 22 out of 28 European Union member states are part of the Schengen Zone, Cyprus, Bulgaria, Romania and Croatia—have not yet been admitted to the Schengen area. Cyprus, which joined the EU in 2004, has to solve the Cyprus dispute before joining the borderless territory of Schengen. On the other hand, although Bulgaria and Romania joined the European Union in 2007, their bid to become part of Schengen has been rejected by the Council of Minister in September 2011. Whereas Croatia, was requested to conduct a technical evaluation which started on July 2015. On June 2017 it joined the SIS II for law enforcement cooperation, and the further progress is a political issue. The Republic of Ireland and the United Kingdom are the only EU members which refused to sign the Schengen Agreement, prior to the 2004 enlargement. Both countries have formed a Common Travel Area with passport-free travel for their citizens and the three British Crown Dependencies of Jersey, Guernsey and the Isle of Man, that are outside the European Union. Britain refused to sign the agreement because it is easier for an island nation to maintain borders, while Ireland assessed that it was not in its interest to end the travel agreement with Britain and reestablish the border checks. Though Monaco, San Marino and the Vatican City have no border controls with the Schengen countries that surround them officially they are not part of the Schengen Area. While Monaco has an open border with France, the Vatican City and San Marino have an open border with Italy. Andorra retains border controls with both France and Spain and accepts Schengen Visas (multiple-entry visas only). On the other hand, Liechtenstein which has been a Schengen zone member country since 2011, does not issue visas, but recommends visitors to apply for a visa at other Schengen countries. The Canary Islands, the Azores and Madeira are the only countries which are part of the Schengen Zone, while they are not located in the European continent. The territories of the European Union Members that are outside of Europe, are exempted from the European Union. For example the French overseas departments of French Guiana, Guadeloupe, Martinique, Mayotte and Réunion, and the overseas collectivity of Saint Martin as well, are part of the European Union but do not part of the Schengen Zone. The six Dutch territories in the Caribbean and the Danish territories of the Faroe Islands and Greenland as well, are neither part of the European Union or the Schengen Area. The member countries do not carry out border checks at their internal borders and also carry out harmonized controls, based on clearly defined and jointly agreed criteria at their external borders. A citizen passing from one Schengen country to another Schengen country does not need to undergo border checks, which means he or she does not have to show a traveling document at the borders. However an identification document (ID or passport) is necessary at ports and airports. The Schengen member states are obligated to remove all obstacles in order to enable a fluid flow of the road traffic. Police checks may be carried out only with the purpose to prevent possible threats to public security. Within the area there is an increased police operation, in particular through hot pursuit, cross-border surveillance, as well as the establishment of joint police centers and teams. Also the Schengen member countries have common rules for the non-Schengen countries’ citizens applying to cross the EU’s external border, including common asylum policies. The Schengen rules still allow national authorities of each country to exceptionally and temporarily reintroduce internal border controls in case of a serious threat to security or of serious deficiencies at the external border that can put the overall functioning of the Schengen area at risk. This is regulated through the Regulation (EU) No 1051/2013 that the EU has adopted. And lastly, in order to join the Schengen Area, the candidate state must connect to and use the Schengen Information System (SIS) and the Visa Information System (VIS). Applicant countries have to undergo a “Schengen evaluation” before joining the Schengen Area. There is also something called a Schengen Evaluation Mechanism, which controls the member countries, whether they are carrying their duties as they are supposed to. Approximately, each year 5 to 7 member states are evaluated through visits by the Commission teams of experts. After each visit a Schengen Evaluation Report is drawn up. If it identifies any weakness on the evaluated country, then recommendations for remedial action are presented. 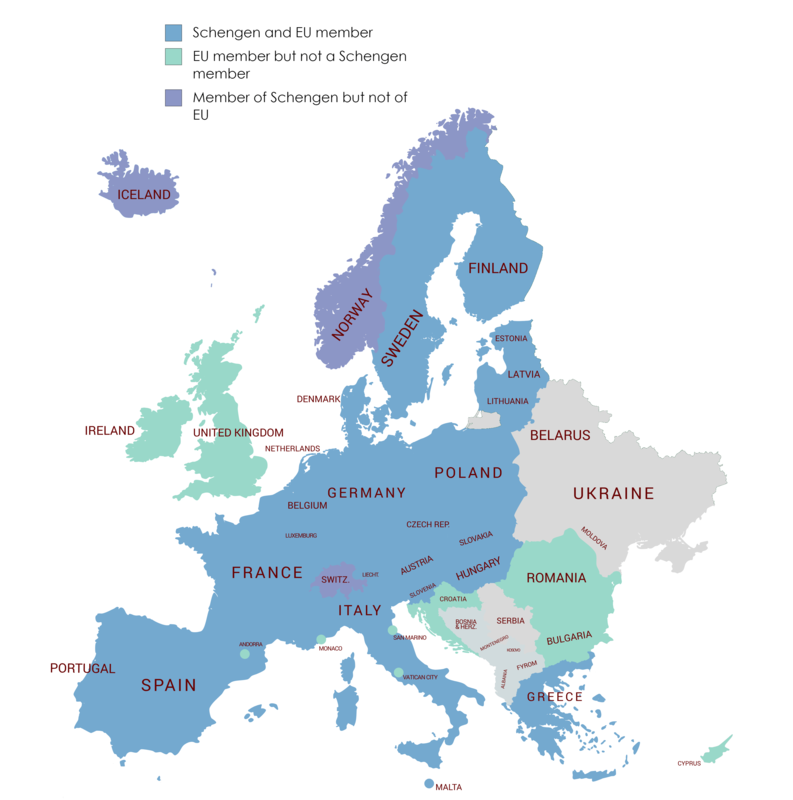 The European Union member states have a common list of the countries, the nationals of which need a visa in order to enter the Schengen territory. The EU decides on visa exemptions case by case. The Schengen states also have common rules for issuing short-stay Schengen visas, which are valid within the entire Schengen area. These visas allow a person to stay and travel in the territories of Schengen states for a maximum of 90 days in any six month period. Depending on the purpose of your travel the embassy or consulate of your Schengen destination country will issue you the appropriate visa. Technology plays a crucial role in the Security System of the Schengen Area, in the reinforcement of external borders and the collecting, processing and sharing of information that is relevant to external border management. The Visa Information System (VIS) consists of a central IT system which is linked to national systems through a communication infrastructure and collects all of the information entered in the latter, thus permitting the Schengen countries to exchange visa data. The central system registers every data that is entered in the national systems as decisions relating to applicants for short stay visas to visit, and also performs matching, primarily of fingerprints, for identification and verification purposes. VIS enables an easier way to verify the identification of the person presenting the visa at border checks in the Schengen territory thus avoiding fraudulent documents and fighting and preventing fraudulent behaviors such as “Visa shopping”. It also facilitates the process of visa issuance, especially for frequent travelers, and makes it easier to decide which of the European Union states is responsible for the examination of an asylum application. The Schengen Information System (SIS) has been established by the Schengen member countries in order to have a highly efficient large-scale information system that supports external border control and law enforcement through cooperation between the countries. The Schengen Information System operates in the European Union member states, aside of Ireland and Cyprus, and the 4 Schengen associated countries (Norway, Iceland, Liechestein and Switzerland). Bulgaria, Romania and Croatia, are yet not part of the Schengen Area therefore they still face restrictions, which will be lifted as soon as the three of these countries become part of the Schengen Area. The United Kingdom, as non-Schengen Area country, but an EU member country, operates the SIS but it cannot issue or access Schengen-wide alerts for refusing entry or stay into the Schengen Area. Ireland is still carrying out preparatory activities to connect with the SIS, but even after it gets its access to the SIS, it will be in the same position as the UK is. Cyprus is not yet connected to the SIS since it has a temporary derogation from joining the Schengen area. The EURODAC is Europe’s first asylum fingerprint database. It has been established in 2003, and consists of a central system that gathers all of the fingerprint data registered by the national systems in the Schengen member countries. Every person that applies for asylum in the EU has his fingerprints registered in this system. One of the key achievements of this system is that is allows the member states to compare fingerprints linked to criminal investigations, for the purpose of prevention, detection and investigation of serious crimes and terrorism. The first reform package of the EURODAC was introduced in May 2016, proposed the use of other biometric identifiers as facial recognition and collection of digital photos. The first fingerprint database was set in German, two years after the Dublin convention in 1992, and the EURODAC was established after more than 10 years later as a result of frequent migrant flows in Europe.